What would you do in order to survive? 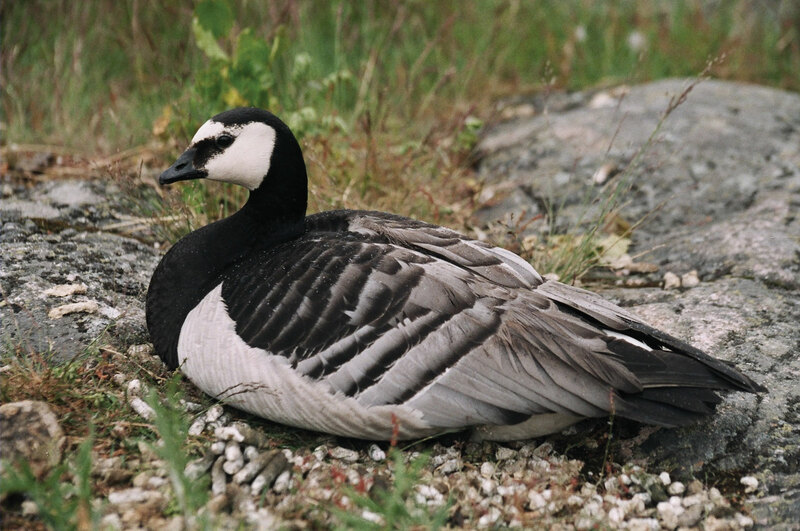 For the young of the Barnacle Goose, Branta leocopsis, survival means jumping off a cliff within two days of hatching, a drop of fifteen to thirty feet below (Jourdain, 1922) to the jagged rocks that lie in wait. 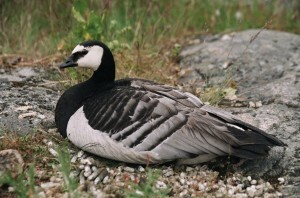 In a bid to avoid predators, Barnacle Geese and other seabirds such as guillemots and kittiwakes build their nest on mountain cliffs and rocky crags (Ducks Unlimited) that “can be as high as 160 feet above the seashore” (oeillade, 2009) and are not easily accessible. This unusual location keeps away Arctic Foxes and polar bears which are their main predators, thereby providing a safe breeding ground and nesting site. However, Barnacle Geese are strict vegetarians, and “food supply is rarely in the same area as the nest” (Wildfowl & Wetlands Trust, 2008). The adult geese have no problems flying to a tundra nearby where food is abundant, but for the young hatchlings which are still unable to fly, they have to face one of their toughest challenges in life. This is because, as with all geese, the parents are unable to convey food to them (Jourdain, 1922) and cannot carry them down from the high cliff ledge in their beaks or on their backs. Hence, in order to feed, they have no choice but to literally take a big leap of faith. Their feathery down and light weight helps to reduce the impact from the great fall. However, it does not end there. In the event that they do survive the fall, they still have to “continue their death-defying migration to the river at the foot of the cliff” (PBS.org) in order to reach their source of food, a journey that is made all the more treacherous by the presence of predators. Parent geese would call out in an attempt to divert the predator’s attention from their vulnerable young, but many helpless young geese still fall prey to their predators. On the bright side, many goslings do survive against all odds, despite this seemingly impossible “rite” of life *smiles*. This amazing feat of theirs earned them the number one spot on Animal Planet’s Most Extreme Daredevil episode, defeating the eagle, pelican, click beetle and bharal. The following is a heartwarming documentary on the Barnacle Geese from the series Nature. Enjoy! “Kingdom of the Ice Bear: The Land of Beyond” (1986). Narrated by George Page. Nature. Thirteen/WNET New York. Posted as “The Geese From Sparta” by xerocool101. Retrieved from http://www.youtube.com/watch?v=i4Dhm8FpjC0. We don’t just mate. We are earthquake indicators too. The next time you take a walk in San Ruffino Lake, Central Italy, and saw toads around, relax, enjoy the beautiful scenery and be rest assured that you won’t experience any earthquake while you are there. Dr Rachel Grant of the Open University in UK was carrying out a daily observational study on the behavior of common toads, Bufo Bufo, in San Ruffino Lake, a common breeding site for them, when she observed unusual toad breeding behaviors. This happened around the time when an earthquake struck L’Aquila, Italy, in 2009. There were no clues as to how the toads sensed the impending earthquake but the population declined by 96% in the breeding site 5 days before the earthquake occurred. The lake is situated 74.29 Km away from the earthquake epicentre. Bufo Bufo is usually found on land and, only during their breeding season, in water bodies such as ponds and lakes. There are usually more males than females in the breeding sites and competition to pair with females occur. Males will grab the opportunity to cling on to the back of a female that is heading towards the breeding site (as can be seen from the 1st picture). Those who fail to find an available female will attempt to displace the attached male (shown in the 2nd picture). The successful pair will proceed to the spawning sites where spawning occurs. The males usually hang around after his first spawn and attempt to carry out subsequent mating with another female during the entire breeding season. The success rate is usually very low due to the competition for females. View normal Bufo Bufo spawning behaviour here. What was unusual for the toads in San Ruffino Lake was that it was in the midst of the spawning period and the number of breeding pairs suddenly dropped to zero 3 days before the earthquake. There were very little breeding pairs from the period of the earthquake to the last aftershock. Fresh spawns were only observed 6 days before the earthquake and 6 days after the last aftershock. No fresh spawn were observed in the period before the last aftershock, meaning that no breeding took place at all. The most probable reason for the decline in population was that the toads were fleeing to higher grounds for safety, to prevent themselves from being killed by falling objects. There were various speculations about how the toads detect the impending disaster but there are no existing concrete evidence for support. This amazing observation which happened to take place during the period of a natural disaster shows us how intricately life is linked to the environment. Having this knowledge at the back of our minds, keep a look out for toads in spring, if you happened to be in Europe, and be thankful to have this natural earthquake indicator around you. N. B. Davies & T. R. Halliday, 1979. 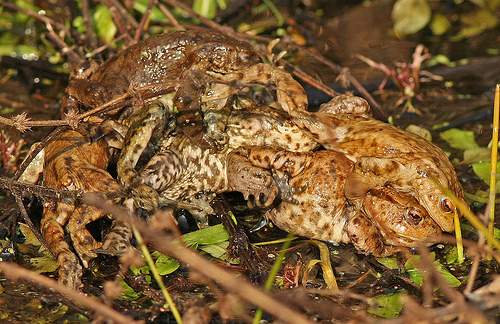 Competitive Mate Searching in Male Common Toads, Bufo Bufo. Animal Behaviour, 27, 1253-1267. Toads can ‘predict earthquakes’ and seismic activity, by Matt Walker. BBC News, 31st March 2010. URL: http://news.bbc.co.uk/earth/hi/earth_news/newsid_8593000/8593396.stm (accessed on 5th April 2010). 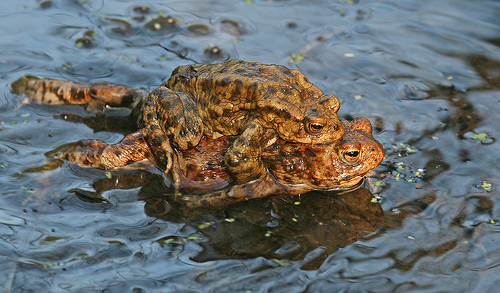 “Mating Toads” by nutmeg66. Flicker, 25th March 2009. URL: http://www.flickr.com/photos/rachel_s/3385386089/ (accessed on 8th April 2010). “Common toads (Bufo bufo) in amplexus” by nutmeg66. Flicker, 25th March 2009. URL: http://www.flickr.com/photos/rachel_s/3385386087/ (accessed on 8th April 2010). Lion’s roar: In real and reel. The lion, Panthera leo, is one of the most common animal symbols used in human culture. It is often recognised as a representation of majesty, courage, strength and excellence because of its physical attributes as well as its powerful roar. However, there are variations and accompanying functions of a lion’s roar. McComb, Packer and Pusey (1994) explained that “in the pride, both sexes roar in order to broadcast ownership of a territory, to stay in contact with other members of their social group and, under some circumstances, to attract mates.” Additionally, functions of roaring also differ between resident and nomadic male lions. Analysing the reel life depiction, Disney’s The Lion King movie, two functions of the lion’s roar can be seen. In the first instance, Simba the young lion roared when he officially reclaimed his rightful position in the land after overthrowing his tyrannical uncle, Scar, who was the opponent to the throne. This illustrates Grinnel and McComb’s (2001) point on roaring as an advertisement of territory. Secondly, the other lions in Simba’s pride roared in chorus after him, corresponding to the point that roaring helps “to stay in contact with other members of their social group.” Apparently, in preparation for the filmmaking, the creative team for the movie had visited Eastern Africa to experience close encounters with real lions in order to understand their behaviours and capture every subtlety (The Lion King, 1994). Similar observations of vocal signalling for the purposes of the establishment and maintenance of territories are also found in the male sea lions, Zalophus californianus (Schusterman and Dawson, 1968). Grinnell, J. & K. McComb, 2001. Roaring and social communication in African lions: The limitations imposed by listeners. Animal Behaviour, 62(1): 93-98. “King lion under attack – BBC wildlife,” by BBC. BBCWorldwide Youtube Channel, 04 April 2008. URL: http://www.youtube.com/watch?v=BjByTjOkyi0&feature=PlayList&p=3BD71C8CA4378348&playnext_from=PL&index=14 (accessed on 03 April 2010). McComb, K., C. Packer, & A. Pusey, 1994. Roaring and numerical assessment in contests between groups of female lions, Panthera leo. Animal Behaviour, 47, 379–387. Schusterman, R. J. & R.G. Dawson, 1968. Barking, dominance, and territoriality in male sea lions. American Association for the Advancement of Science, 160: 434-436. “Simba vs Scar,” by 0necardsh0rt. Youtube Channel, 15 October 2007.URL: http://www.youtube.com/watch?v=XrW6KTE08xg&feature=related (accessed on 03 April 2010). “The Lion King,” by J. Wilmes. Thelionking, 25 May 1994. URL: http://www.lionking.org/text/FilmNotes.html (accessed on 06 April 2010). Two male Vogelkop bowerbird using their bowers to ‘seduce’ the mate. Video by BBC. The bower, built and decorated by the male bowerbird, is a site for sexual display and mating. This video illustrates the importance of the bower for the male Vogelkop bowerbird (Amblyornis inornatus). Being mainly olive brown in colour with no ornamental plumage, the Vogelkop bowerbird however, has one of the largest and most elaborate bowers. The bower substitutes the dull plumage, and act as an alternative form of mate attraction as contrasted with the conventional bright plumage of males in other bowerbirds such as the male Satin bowerbird. In this video, two male Vogelkop bowerbirds constructed their bowers on the forest floor. The objects used to build and decorate individual’s bower, are dependent on the bowerbird’s preference; one prefers bright colored objects eg. orange flowers, while the other prefers dark colored objects eg. deer dung. When the female arrives to inspect each bower, the male struts and sings, convincing her to enter the bower for mating. Eventually, the female mated in the brightly colored bower, as she was less convinced with the darker colored bower perhaps because of the sprouting fungus from the dung! It is interesting to note the importance of visual display to the female bowerbird and truly, the prettier and ‘cleaner’ bower was chosen! Sexual selection occurs in the Vogelkop bowerbirds. The sexual mechanisms displayed are inter-sexual selection (female choice of males) and intra-sexual competition (male competition for females). The females discriminate among their potential mates as males provide them only with sperm thus there is a need to ensure the health and vigor of their offspring (Borgia, 1986). Elaborate bowers and decorated display courts evolved as a result of female preference (Borgia & Albert, 2000). By the male’s ability to build, maintain, and display high-quality bowers, despite the attempts of other males to destroy bowers and steal decorations, males give females a means of assessing their dominance status and ultimately, their quality as mates (Borgia, 1985). Additionally, older males are preferred as females assumed that they tend to carry heritable traits promoting survival, such as diseases resistance or predator avoidance. The ability to survive to an old age but also has been able to maintain a high quality bower under the rigors of male competition enables the lucky male to be selected for mating! 1) Borgia, G. 1986. Sexual selection in bowerbirds. Scientific American 254: 92-101. 2) Borgia, G. 1985. Bower quality, number of decorations and mating success of male satin bowerbirds (Ptilonorhynchus violaceus): an experimental analysis. Animal Behavior 33: 266-271. 3) Borgia, G & Albert, J. C. U. 2000. Sexual selection drives rapid divergence in bowerbird display traits. Evolution 54: 273-278.
http://www.youtube.com/watch?v=E1zmfTr2d4c (accessed on 1 April, 2010).